Also Featured on Wellnessforce ! There are many forms of protein supplementation. We are often bombarded with aisles of foods that have added protein and towering shelves full of tubs of various kinds of powders. What are the differences? How can they be beneficial? How about other types of protein supplements? How much do I need? Today, we will weigh in on whey. Whey is a dairy protein that is available as either a whey protein concentrate, whey protein isolate, or a whey protein hydrosylate (a.k.a. hydrolyzed whey). Whey protein concentrate in supplements is typically available as 70% – 80% total protein by volume. The remainder of the volume is made up of carbohydrates – mostly lactose – and some fat. Whey protein isolate is usually ≥90% total protein by volume. Since whey protein isolate has insignificant amounts of lactose, it tends to be a more appealing option for those of us that may have lactose intolerance. Whey protein hydrosylate is whey protein isolate that is enzymatically “pre-digested” to make smaller peptides. What this does is allow you to absorb and utilize its amino acids at a faster rate after consumption. There are many reasons why whey, in all its forms, is so popular in sport supplementation. The lower cost of production and more favorable taste characteristics have heavily contribute to its dominance in the industry. However the higher BCAA content, especially of Leucine, relative to other types of protein makes whey a more attractive option. Studies have shown that Leucine, in the context of whey protein, is critical to increasing muscle protein synthesis and that it may be involved in suppressing muscle protein degradation. This is particularly of interest for those athletes that are pursuing greater muscle size. Other studies have shown that this has contributed to improved muscle performance for athletes that regularly train. The quick digestion rate of whey causes an increase in amino acid levels in the blood faster than from proteins such as casein or soy. This is important for maximizing post exercise muscle recovery. 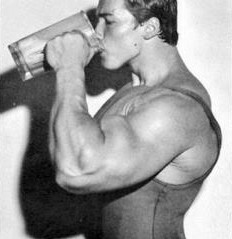 The amino acid levels tend to return to a baseline 2 to 3 hours after consumption of whey. With respect to whey itself, whey protein concentrate digests slowest and hydrolyzed whey digests fastest. However, when whey is hydrolyzed the process does not yield the same end-product on a molecular level. In other words, the degree of “pre-digestion” varies and is why science is still exploring the various differences between types of whey protein. It has been suggested that a slower digesting protein that causes a longer duration of increased amino acids in the blood, such as casein or soy, may be beneficial to consume prior to bed to enhance protein synthesis while sleeping (which already occurs at a higher rate during this time). What is the perfect amount of protein to take and at what point? Research is continuing to develop on this topic. At the moment, there is no one formula that answers this question for everyone consistently. Age, type of training, health and physical activity history are all factors that affect how much is enough. If you’ve been an avid lifter for years, your body’s ability to use a certain amount of protein will likely be higher than of people who have just started a new workout program. This has been dubbed as the “muscle full effect”. 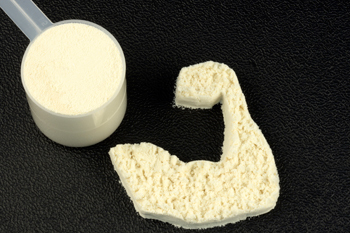 Although as little as 10g of whey protein has shown to induce muscle building after resistance training, one study concluded that 20g consumed immediately after resistance training was adequate for optimal muscle protein building for young men (in their very early 20’s). On the other hand, 40g was best in older male adults in both exercised and rested muscle. Unfortunately, for sports performance, this means that at this time we are left with trial and error. In the cases of general health or medical conditions, it is best to consult a registered dietitian for an appropriate nutrition prescription. Overall, whey protein may be a good option for you if you exercise frequently, intensely on a regular basis. In such circumstances, it will help reduce muscle soreness, recovery time and increase muscle mass. For those that aren’t pursuing the physique of Lou Ferrigno, the greater availability of amino acids in the body after consumption of whey will contribute to the muscle mass necessary for athletic performance, all forms of exercise/activity and general health. If you practice a plant based diet, supplementation through plant-based proteins are very suitable, especially soy protein with its antioxidants and anti-inflammatory properties. Interestingly, a new study has come out indicating that a soy-diary protein blend has equivalent muscle protein building effects as whey, but with a longer digestion time it may be useful to other protein synthesis processes relevant to the aging population, muscle wasting diseases or cancer patients. It will truly be exciting to see what science will discover! Hulmi, Juha J., Christopher M. Lockwood, and Jeffrey R. Stout. “Effect of Protein/essential Amino Acids and Resistance Training on Skeletal Muscle Hypertrophy: A Case for Whey Protein.” Nutrition & Metabolism Nutr Metab (Lond) 7.1 (2010): 51. Web. 21 July 2015. <http://www.biomedcentral.com/content/pdf/1743-7075-7-51.pdf&gt;. Witard, Oliver C., Sarah R. Jackman, Leigh Breen, Kenneth Smith, Anna Selby, and Kevin D. Tipton. “Myofibrillar Muscle Protein Synthesis Rates Subsequent to a Meal in Response to Increasing Doses of Whey Protein at Rest and after Resistance Exercise.” The American Journal of Clinical Nutrition 99.1 (2014): 86-95. Myofibrillar Muscle Protein Synthesis Rates Subsequent to a Meal in Response to Increasing Doses of Whey Protein at Rest and after Resistance Exercise. The American Journal of Clinical Nutrition, 2014. Web. 23 July 2015. <http://ajcn.nutrition.org/content/99/1/86.full.pdf html>. Reidy, Paul T., Dillon K. Walker, Jared M. Dickinson, David M. Gundermann, Micah J. Drummond, Kyle L. Timmerman, Christopher S. Fry, Michael S. Borack, Mark B. Cope, Ratna Mukherjea, Kristopher Jennings, Elena Volpi, and Blake B. Rassmusen. “Protein Blend Ingestion Following Resistance Exercise Promotes Human Muscle Protein Synthesis.” The Journal of Nutrition 143.4 (2013): 410-16. The Journal of Nutrition. Web. 23 July 2015. <http://jn.nutrition.org/content/143/4/410.short&gt;. Pasiakos, Stefan M., Harris R. Lieberman, and Tom M. McLellan. “Effects of Protein Supplements on Muscle Damage, Soreness and Recovery.” Sports Medicine 44 (2014): 655-70. Spring International Publishing Switzerland, 01 May 2014. Web. 26 July 2015.